I read this article and found it very interesting, thought it might be something for you. The article is called 6 Indicators of India’s Looming Demographic Disaster and is located at https://archive.indiaspend.com/cover-story/6-indicators-of-indias-looming-demographic-disaster-99797. India will need to generate 280 million jobs between now and 2050, the year when the working-age population (15 to 64) will peak, according to a new report, amid indicators that the country’s demographic dividend could be at the cusp of disaster. Over 22 years of unprecedented economic growth (1991 to 2013), less than half the Indians who sought jobs got them, 140 million of 300 million, according to a new United Nations Development Programme (UNDP) report. In 2015, India added the fewest organised-sector jobs—in large companies and factories—in seven years across eight important industries. The proportion of jobs in the unorganised sector—without formal monthly payment or social security benefits—is set to rise to 93% in 2017. Rural wages are at a decadal low, as agriculture—which accounts for 47% of jobs—contracted 0.2% in 2014-15, growing 1% in 2015-16. As many as 60% of those with jobs do not find employment for the entire year, indicating widespread ‘under-employment’ and temporary jobs. The formation of companies has slowed to 2009 levels, and existing companies are growing at 2%, the lowest in five years. With large corporations and public-sector banks financially stressed, the average size of companies in India is reducing, at a time when well-organised large companies are central to creating jobs. With a million jobs required every month—the UNDP report says eight million are required every year until 2050—dominant castes across various regions are reacting violently to unfulfilled aspirations, as IndiaSpend reported in February 2016. Employment shrank over two quarters of four in 2015, the first time since the 2008 global financial crisis, according to the latest data from the Labour Bureau’s Quarterly Employment Survey. Source: Quarterly Report on Changes in Employment in Selected Sectors, Labour Bureau, Ministry of Labour and Employment. The first quarter, January to March 2015, added 64,000 jobs, while the third quarter, July to September, added 134,000 jobs in eight sectors that the Bureau surveys on “changes in employment” (not existing jobs): Textiles (apparels), leather, metals, automobile, gems and jewellery, transport, IT/BPO and handloom/power loom. However, in the second quarter, April to June, 2015, 43,000 jobs were lost, and in the last quarter of the year, October to December, 20,000 jobs were lost. These jobs were to be in industries that comprise Prime Minister Narendra Modi’s Make in India programme, a manufacturing expansion meant to offer jobs to the millions moving out of agriculture. The employment generated per quarter slowed since after the relatively short-lived 2008 financial crisis, indicating that the current global slowdown is steadier, as IndiaSpend reported earlier. Recent Reserve Bank of India data on “Assessment and Expectations for Employment Outlook” indicates India’s jobs gloom. “The survey indicated moderate increase in optimism for production, financial situation and salary for fourth quarter (January to March 2016) of 2015-16 as compared with previous quarter. However sentiments on other indicators, viz. exports, imports, employments, profit margin and overall business situation, deteriorated,” the RBI quarterly industrial outlook report said. The informal sector accounted for 90% of jobs through the period 2004-05 to 2011-12, said the Economic Survey 2015-16. This is going to increase marginally to 92-93% in 2017, according to a report by the National Commission for Enterprises in the Unorganised Sector (NCEUS). The accelerated growth of the Indian economy over the past two decades is accompanied by increasing informalisation, notes the Report of the Committee on Unorganised Sector Statistics by the National Statistical Commission. 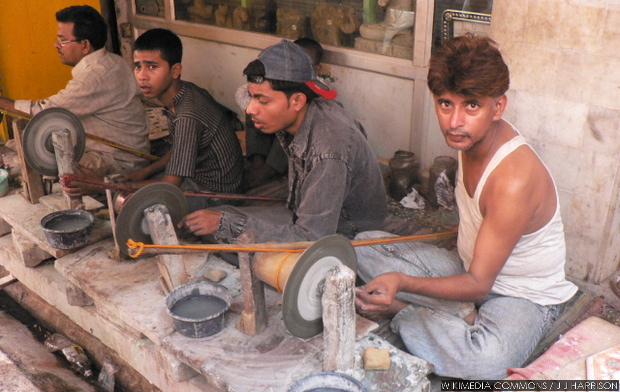 The proportion of ‘own account establishments’, such as carpenters and street-kiosk owners, has jumped from 64% of all establishments in 2005 to 72% in 2013, according to the Sixth Economic Census. The proportion of larger companies—which range from accountancy firms, IT services companies to a Tata Motors—reduced from 35.6% in 2005 to 28.3% in 2013. In China and Southeast Asia—regions of high literacy—farmers moving off the land found factory jobs. With illiteracy widespread in India, farm labour appears to be the main option. Those who get a better education and move to cities find that construction labour, maids and security guards are most in demand, as IndiaSpend had reported in 2014. From 2001 to 2011, the number of farmers fell 7%, from 127.6 million to 118.6 million. Over the same period, agricultural labourers increased 34%, from 107.5 million to 144.3 million, as IndiaSpend reported. Agricultural growth nosedived over the last two years, with three, and possibly four (the data for January to March 2016 are not yet out), quarters registering a contraction. Rural wages are growing at a much slower pace compared to the initial years of India’s rural jobs programme, the Mahatma Gandhi National Rural Employment Guarantee Scheme (MGNREGA), the wages of which were down at 2005 levels in 2015, as IndiaSpend reported. The construction sector—building roads, bridges and ports—is rapidly becoming India’s fastest-growing employment destination. More specialised sectors of the economy cannot absorb those leaving farms because they do not possess the skills needed. Modi’s Skill India initiative aims to train 400 million Indians over the next six years—that’s a million every week. In 2014, as we reported, no more than seven million were trained; fewer than 5% of Indians have ever received formal skills training. Many Indians who report themselves as ‘employed’ do not get year-round work, or may have jobs lagging their abilities and expectations, said the Fourth Annual Report on Employment and Unemployment 2014. Only 60.5% of the working population (above 15 years) was able to find work through the year. Underemployment affects youth the most. Of 100 persons aged above 30, only two persons report being fully unemployed, while in the 18-29 age group, 13 in 100 are unemployed, noted the survey. Education only appears to increase the prospect of unemployment. This could be because educated young people prefer to remain unemployed than work in jobs they consider below their qualifications or dignity. Job options in the sectors they desire are receding. The growth of eight core industries—coal, oil, oil products, gas, electricity, fertiliser, steel and cement—is now the lowest it has been over the last ten years. Source: Key Economic Indicators report, Industrial Handbook 2008-09, Office of Economic Advisor; Annual Report 2015-16, Department of Industrial Policy and Promotion. Note: 2015-16: April to January period over April-January 2014-15. Industrial growth of the last decade (represented here by the year-on-year growth in the Index of Industrial Production) shows a slump during the 2008 crisis; it recovers and again goes south till 2015-16. The number of companies registered every year is—after a peak in 2012—down to 2008 levels, an indication of business uncertainty. In 2014, as many as 70,043 companies were registered in India, marginally less than 70,513 in 2008. Fewer than 2,000 companies were registered in April 2016, the first month of the new financial year, 2016-17, according to ministry data. In comparison, 6,000 companies were registered monthly, on an average, during the last decade. Indian companies are also hiring fewer employees: The average number of employees employed in an establishment reduced from 2.41 to 2.24, according to the Sixth Economic Census. “It’s well known that the small size of Indian firms is a major reason for their abysmal levels of productivity,” columnist Manas Chakravarty wrote in Mint earlier this month. Employment in companies employing more than 10 workers declined from 37.1% in 1990 to 21.15% in 2013. Large corporations are important to India’s economy, RBI Governor Raghuram Rajan said in February, but many are struggling to repay loans and grow, potentially sparking a circle of low growth, low bank credit, job cuts, low output and low growth. So, a paradox unfolds, with many young Indians, many with substandard education, unable to find jobs commensurate with their education, while industry endures a shortage of skilled labour. The story has been updated to reflect the correct working-age population and the year in which India will have the world’s largest working-age population. The correct year is 2030 and not 2020, when India will have over a billion working-age people. Thank you very much for a well studied report. Is it possible to provide impact of job less growth on overall social progress of the country?